Does Running Give You Muscular Legs? 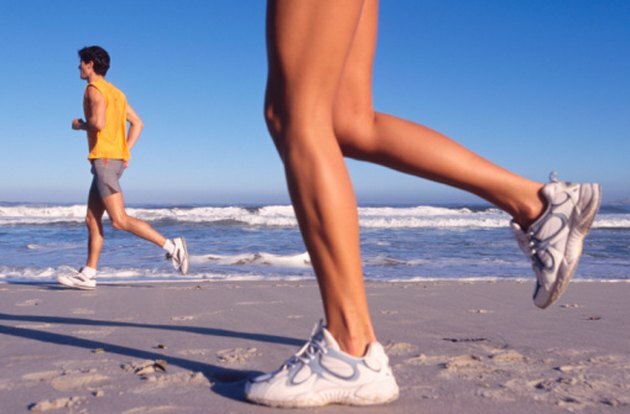 If you are starting or increasing a running program, you probably know that running is great for your cardiovascular fitness and overall health but you might wonder if running give you muscular legs.The answer is a qualified yes – because running primarily uses your legs, you will develop sport-specific muscles over time. However, the type of running you do makes a big difference – long-distance running builds leaner muscles, while sprinting adds bulk. By understanding the effect of running on each of your main leg muscle groups you can tailor your fitness plan to build muscle where you want it. Depending on whether you are jogging or sprinting you utilize one of two types of muscle fiber: slow-twitch or fast-twitch. According to “AQA Sport Examined” long-distance running uses slow-twitch fibers which are not as strong as fast-twitch but have a good oxygen supply and can work for long periods of time without tiring. By contrast, fast-twitch muscle is stronger but tires quickly, so it works when you are sprinting. The bulging leg muscles of sprinters are because they have more fast-twitch muscles, while the lean legs of distance runners are composed of slow-twitch. The quadriceps is the largest muscle group in your body, according to “Running Anatomy.” Composed of four component muscles, your quads lift and extend the knee while running. In a fast run, the quads engage more strongly to lift your knee higher and thus extend your stride, which is why sprinters have such powerful quadriceps. Endurance running, on the other hand, makes fewer demands on the quadriceps, because it is a forward motion driven from the hip. If you are trying to slim your thighs, long-distance running is an excellent way to build lean muscle and balance your thigh. Your calf muscles are the most important muscle for running, according to Jeff Galloway in “Mental Training for Runners.” They play an essential role in propelling you each step forward, meaning that you will develop muscular, toned calves with regular running. However, he notes that excessive speed-work, or sprinting at the end of runs can lead to injury as you push off from your toes, which stresses the calf. Running barefoot can help strengthen your calves, as does hill-running. The hamstrings are the prime mover in long-distance running, according to professional runner and yoga expert Beryl Bender. She notes that the hamstrings get very strong with regular running but they can also become tight, which can cause injuries through muscular imbalance. By stretching and varying your running training you can develop muscular legs safely. For example, if you are a long-distance runner, include some sprint work or hill training to improve your quad and calf strength; if you are a sprinter, do some long runs to keep your hamstrings strong and flexible.